So many of you may know me as the guy who make's videos from time to time, I used to cover BC Cup fairly frequently, I've also had a front page article from time to time, and I even made an appearance in a Spoked Media shirt covering Crankworx last Summer. I try to do what I can to help promote and support the bike community, working at the local shop I don't make a crazy $25 an hour nor do I work 50 hours a week raking in the cash to do with what I please. On top of all of it, I just recently graduated high school, and now I have to personally pay for my university Journalism education. So what I'm trying to say is, I don't have a lot of money to put back into what I love, taking photos and making films. That's where all you Pinkbike readers come in. So here's the plan....! About a year back, I started a little "business" with my friends, making sweaters to sell to fund our own sweater making fetish. We were known as Rainshine Apparel. After finding out that it took more hours to sew a sweater then it did to knit one, the whole thing fell apart. I spent the next few months learning to print t-shirts still using the Rainshine logo just to try a keep things going, but it never took off and I couldn't commit to it enough to try. So you're probably wondering what this has to do with you. Well, in simple terms, I want your money, but in more attractive terms, I want to lend my skills to give you something that perhaps you've always wanted, needed or desired, in order to help fund my photography/film passion. I am proposing to either design a selection of shirts that I could print for a reasonable price, and sell them to the local Pinkbike community. A project I am currently working on for a friend who is using the profits to make a trip to Kenya to build a school. I print each and every shirt I make by hand. From the design process to the finished product I do them personally, by hand. 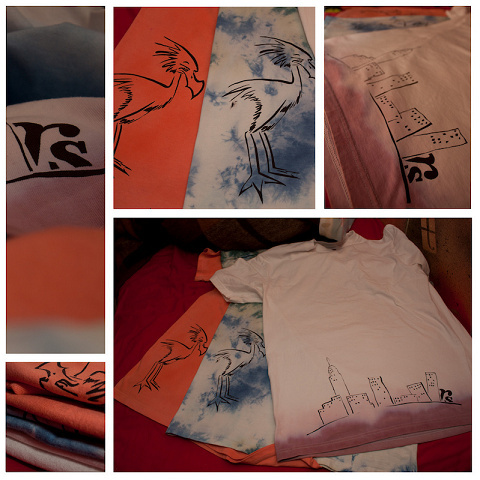 I draw the design, cut out each stencil, and print them onto the t-shirt with no machine or any synthetic assistance. I use a pen, a paper knife and a screen, ink and a squeegee; the result is a 100% authentic, and often one of a kind, hand crafted printed t-shirt. I would like to make a set price for the shirts, with a possible if your friends buy one, I'll give you yours to you at the cost it was to buy the shirt (between $5-$10)! I would like to hook up with any new flim, photo, or bike crews that have a company or team name, and make you a set of shirts with that name, or your favorite logo on it! Like what the work I did for Adam at Spoked Media. I would like to give anyone who would like the opportunity to design a shirt for yourself to send me your design so I can work with you and you can have your own 100% one-of-a-kind t-shirt! 3 Shirts I printed for a friend. 1) Just by reading this write-up would you possibly be interested in purchasing a shirt from me. 2) Is there anything you would like to see on a shirt, or any themes that would entice you to buy a shirt. 3) What do you feel is a fair price for a shirt like this? 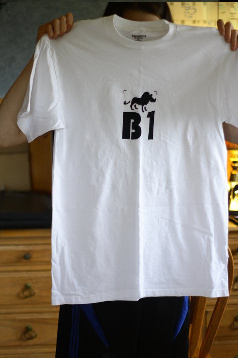 I make shirts out of high quality 100% cotton t-shirts, mainly white. 4) If there is any young aspiring graphic designers who would like to give me a hand, make a shirt that I can make a run of and sell, I would be happy to give you a free shirt and a wack of stickers for helping me out. 5) If you have any other ideas, please please please let me know! Awesome Eric! This sounds like a wonderful idea. Your article is awesome and very insightful on your process. I wish you the best and if I decide to make a shirt your offer and design sounds great! rideOn! I'd definitely be interested in a few for OverDrive Media Group (www.overdrivemediagroup.com). Would we be allowed to resell them later? I'll see what I can do for internation shipping, where are you located? And how many would you be interested in? And you could for sure resell them, I'm guessing if you don't live in the Vancouver area, I wouldn't be able to sell them to your buyers anyways. Depending on the unit cost, I'd be looking at 5-10 to start with. If this is something you'd be continuing to do regularly, I may want to order batches every few months (can' promise anything though). I'm located either in Switzerland or Singapore (Switzerland would be easier to ship to). make them out of american apparel shirts and ill buy one! Sure, send me some logos and I can see what I can come up with! wow, very impressed. good luck. how does payment work, paypall? Still trying to decide, if I get enough interest then I'll go with paypall, but for local sales I might do another method. should you create some basic designs that the artistically challenged can buy. maybe look into vnecks as well. I definitely could make a few designs for people just looking to buy something to wear. I don't know about v necks, I only have Costco to buy shirts from right now, I don't know where I could get the v necks for a good price, but I will look into it.